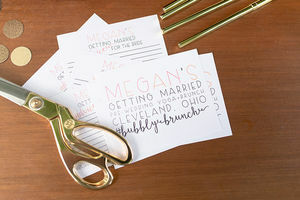 A gorgeous summer day and garden in Cleveland, Ohio provided a stunning backdrop for this bubbly brunch styled shoot. 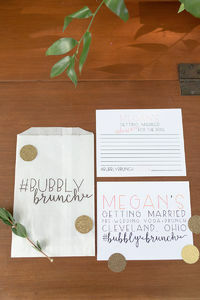 Wedding planner and stylist, McPherson Events & Design, created the concept of a bride and her bridesmaids at a romantic and feminine pre-wedding brunch. 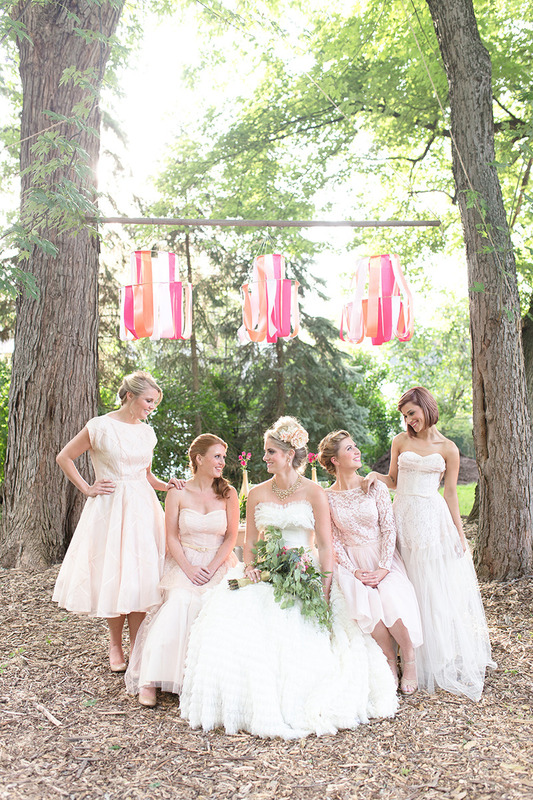 The soft color palette of blush, peach and mint was highlighted with pops of hot pink and gold shimmers. The color and whimsical theme was inspired by MacKenzie-Childs handmade and hand painted ceramics, one of a kind serving pieces and dishes. The outdoor dining room was created with a farm table refinished by Yellow Door Goods, gold chargers and linens from Sitting Pretty Linens, colorful MacKenzie-Childs ceramics and décor from the collection of McPherson Events & Design. Each place setting was accented with a granola heart from CLE Juice Box and place cards from Minor Details CLE. 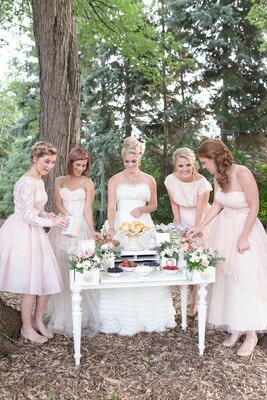 The bridesmaids felt like grown up princesses in their pink frocks. They enjoyed brunch heart-shaped waffles with a selection of whipped cream, syrup and berries, yogurt, banana pecan muffins and even fruit kabobs. The girls couldn’t believe the tiny heart shapes were even carefully cut for their butter and fruit! 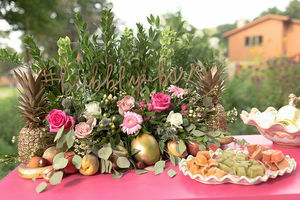 A vintage ironing board featured a tea bar filled with MacKenzie-Childs ceramics and tea pot, macaroons from Bittersweet’s, tea bags with #bubblybrunch tags and pink roses. Of course, no brunch would be complete without amazing drinks. 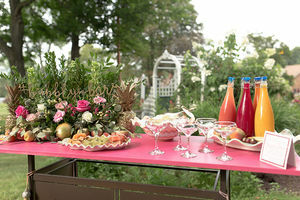 CLE Juice Box created a #bubblybar with a selection of several fresh juices and sparkling wine. 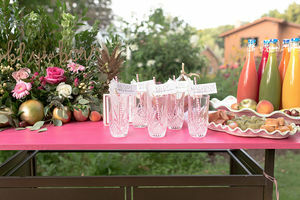 The girls poured their own cocktails and added fresh juice cubes to keep their drinks cold on this summer day. The #bubblybar was decorated with gilded fruit, fresh flowers and a wooden #bubblybar sign all created by McPherson Events & Design. Minor Details CLE created straw flags and signage. The Bride gathered her besties for an early morning tea and backyard yoga to relax and rejuvenate their mind, body and spirit for their day of celebration. 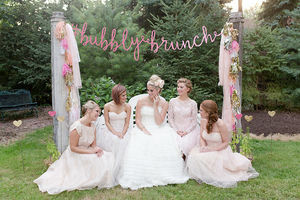 They each wore a #bubblybrunch tank created by Team Bridal Apparel and hair accents from Sunshine Couture. Their hot pink yoga mats were circled by trees and green surroundings. A hot pink #bubblybrunch wood sign handcrafted by McPherson Events & Design hung on antique pillars with accents of tassels from Minor Details CLE and pink fabrics from Sitting Pretty Linens.